Magdeburger Joe.com: France Extraditing Rwanda "Butcher of Tumba"
As a Francophone country, Rwanda is an appealing destination to Rwandan expatriates. After the Rwandan genocide in 1994, there were quite a few Rwandans with blood on their hands who tried to blend into French society. One would think that a gynecologist at a university hospital seeking to open up practice in France would seem pretty tame. But according to the Rwandan government, Sosthene Munyemana, age 45, is no ordinary doctor. according to the government of Rwanda, he personally killed with his bare hands, and lent the persuasiveness of his rank in Rwandan society to further the Hutu genocide of Tutsi Rwandans. The Times of London reports as follows on the disturbing case against Dr. Munyemana. Sosthene Munyemana, 45, was detained on Wednesday by police acting on an extradition warrant issued by Kigali. His arrest seeks to end 15 years of dispute between Paris and Rwanda over the massacres that killed at least 800,000 people in the East-Central African nation. Dr Munyemana, who has been working in a hospital emergency ward at Villeneuve-sur-Lot, near Bordeaux, had been on an Interpol wanted list since 2006 and Rwanda has been seeking his return for a decade but French authorities had delayed proceedings. According to Rwandan investigators Dr Munyemana, an ethnic Hutu and gynaecologist at the University Hospital in Butare, allegedly took part in the massacre of ethnic Tutsis in 1994 and was known as “the Butcher of Tumba”. The Christian Science Monitor, report as follows on the allegations against Munyemana. "Munyemana has been described in the UN and other post-genocide investigations as a close protégé and ideological partner of Hutu power leader Jean Kambanda, who pled guilty to a genocide charge at the Rwandan War Crimes Tribunal in Tanzania. “Clad in a long black coat, armed with a machete, or an iron bar shaped like a pipe, a sword or a gun, he wore banana leaves to motivate peasants,” a 2007 African Rights report said of Munyemana, citing eyewitnesses." Rwanda has a cultural tradition of confession and forgiveness, even for murder. Prior to the1994 genocide were previous instances in 1959, 1963, 1967, 1973 and 1990 preceded the 1994 genocide and fueled a drain of Tutsi Rwandans into neighbouring countries. Each time, there was reconciliation and forgiveness. Even today, there are people who are neighbours to people who they know murdered members of their family. It seems that instead of aborting a cycle of violence and starting anew that the culture of forgiveness has lowered the consequences of murder and cheapened the lives of the victims. There is a lesson to be learned when the long arm of justice reaches around the world to try and punish killers. When someone builds a placid life after perpetrating atrocities and is brought to justice, it teaches a powerful lesson. A murderer should be hunted until his or her last day on earth. If old age wrinkles the brow of a killer, they deserve no rest. They should feel hunted. They should live every day in fear of their shadow, in dread of a price to be exacted for their crimes. A country that lets genocidaires enjoy peace within its borders defiles itself. France is to be commended for assisting Rwanda in bringing Rwanda's killer to justice. Unfortunately, Rwanda has a history of pardoning "small fish" in the Rwandan genocide. In extending forgiveness to those with innocent blood on their hands, forgiveness is cheapened. France has started to do its part. 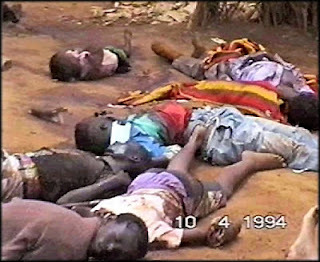 May the blood of Rwanda's innocent be avenged. I had originally written that Rwanda was a colony of France. It is a colony of Belgium. I assumed it to be a former French colony because French is the language of that country. Additionally, it was France and not Belgium that sent in troops in 1994 A reader wrote me as follows. "Rwanda was never ever a colony of France. The only country it was technically colonized by, was Germany. In 1885 the country claimed Tanganyika, Rwanda and Burundi as its own territory. After Germany lost the first world war, Belgium in 1923 accepted the League of Nations Mandate to govern Ruanda-Urundi (Now 2 separate countries: Rwanda and Burundi). Technically, Rwanda was not a Belgian colony but a Mandate region. Rwanda was a francophone country because of the Belgian influence (French is one of the official languages in Belgium). Please check your facts before publishing your stories ... "
I am grateful to the reader for the accuracy check. It should be self understood that I am embarrassed at the inaccuracy on my part. The last sentence was therefore superfluous and I believe a bit snotty. Rather than publish the comment and a link back to the individual's blog, I am quoting her. When she learns some manners, I will be happy to link back to her. I gladly admit my mistakes. I find it annoying to be insulted. I did not mean to insult you at all, and I am sorry that it came across that way. I have lived in Rwanda for quite some time and wrote my thesis on the genocide, so the topic is close to my heart. Thank you for posting my post and replying to my message, I appreciate it. Again - I did not mean to insult you. PS: the reason for my last sentence is that many people do not check their facts before writing and publishing stories online. As a journalist and someone who happen to know my stuff about the genocide - which is not meant as being arrogant - I have read too much rubbish on the Rwandan genocide. I should perhaps have formulated the last sentence differently. My apologies. I respect your sense of professionalism and your care for Rwanda. The Rwandan genocide is an event that haunts me. You sound like you have put your care about Rwanda and the continent of Africa at the center of your life's work. You have my respect.